Researchers consider infant mortality to be a key indicator of population health. Currently, the United States ranks 27th among industrialized nations in infant mortality, but rates within the U.S. vary significantly by race, socioeconomic status, and geography. 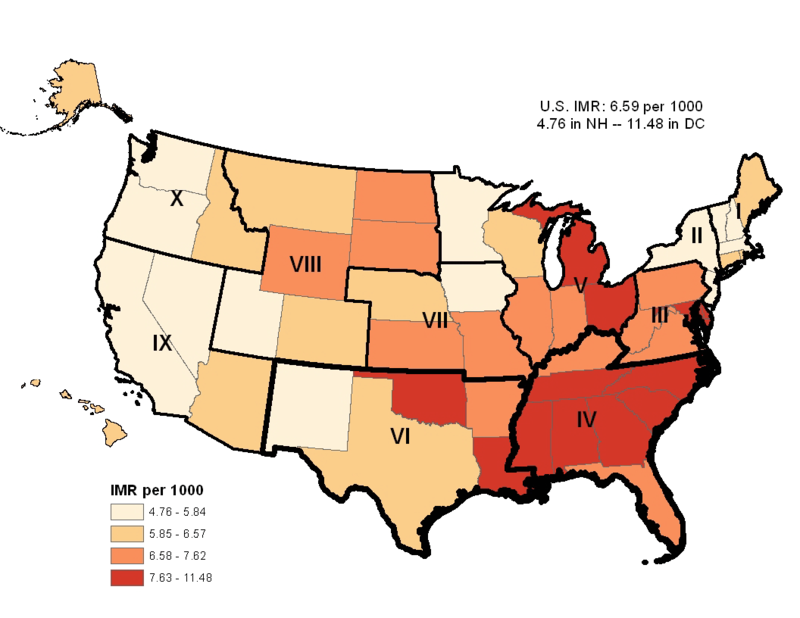 In particular, the Southern states suffer from high rates of infant mortality, along with several other negative population health indicators such as obesity and diabetes. To better understand the contributing factors that lead to high rates of infant mortality in the South, researchers from the U.S. Department of Health and Human Services' Maternal and Child Health Bureau analyzed the most recent National Center for Health Statistics Period Linked Birth/Infant Death Data Files from 2007-2009. The goal of the research was to gain an understanding of the principal conditions and factors that contribute to excess infant mortality rates (IMRs) including race, underlying cause of death, and gestational age. Their findings are published in a new study in the March issue of the American Journal of Preventive Medicine. Overall U.S. IMR for 2007-2009 was 6.59 per 1000 live births. After in-depth data analysis, investigators found that annually there were 1.18 excess infant deaths per 1000 live births in the South, which represents a total of about 1600 excess infant deaths per year, and 5018 excess infant deaths between 2007 and 2009. "Overall, prematurity, congenital anomalies, and Sudden Unexpected Infant Death (SUID) were the three leading causes of death in the South and the rest of the U.S. However, SUID and preterm-related death were the largest causes of excess infant mortality in the South compared to other regions," says lead investigator Ashley H. Hirai, PhD. The study also found that race played a pivotal role in the high IMRs found in the south, but that various groups impacted states differently. "For example, the majority of excess infant mortality was due to higher mortality rates among non-Hispanic white infants in Kentucky and Oklahoma," explains Dr. Hirai. "Conversely, a majority of excess infant mortality in Florida, Georgia, Mississippi, South Carolina, and Louisiana could be explained by compositional differences due to a larger proportion of non-Hispanic black births, which reflects a persistent racial gap that exists across the country." Investigators wanted to pinpoint the factors contributing to high IMRs in the South to help policy makers form successful reduction strategies. Promoting safe sleep practices in hospitals and communities, and preventing and treating chronic conditions before and between pregnancies are just some of the steps that can be taken to address the higher infant mortality rates in the U.S. South. The researchers highlighted the importance of state data systems to recognize needs and priorities among various risk and protective factors that can be targeted for intervention. "To reduce excess Southern infant mortality, comprehensive strategies addressing SUID and preterm birth for both non-Hispanic black and white births are needed, with state-level findings used to tailor state-specific efforts," concludes Dr. Hirai. "These findings can be used to inform the prioritization of strategies within the new infant mortality Collaborative Improvement and Innovation Network (CoIIN) that originated in the South and through other public and private efforts to improve birth outcomes and reduce infant mortality at local and national levels." "Contributors to Excess Infant Mortality in the U.S. South," by Ashley H. Hirai, PhD; William M. Sappenfield, MD, MPH; Michael D. Kogan, PhD; Wanda D. Barfield, MD, MPH; David A. Goodman, PhD; Reem M. Ghandour, DrPH; Michael C. Lu, MD, MPH, is published in the American Journal of Preventive Medicine, Volume 46, Issue 3 (March 2014), DOI: http://dx.doi.org/10.1016/j.amepre.2013.12.006, published by Elsevier. Full text of the article is available to credentialed journalists upon request; contact Angela J. Beck at +1 734 764 8775 or ajpmmedia@elsevier.com. Journalists wishing to interview the authors should contact Samantha Miller, Office of Communications, U.S. Department of Health and Human Services, at +1 301 443 9094 or smiller2@hrsa.gov.